I am currently working on it to add more working them components. 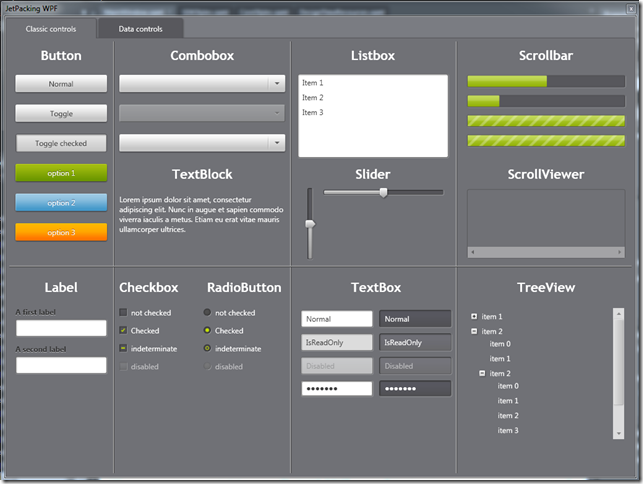 Edit (16/10/2010, 01:28) : I added new controls themes(Scrollbar, ScrollViewer, Slider, TreeView, TabControl, Label) and a new demo applications. Good work, you saved me a ton of work! Will you continue to migrate all the controls? I have a probleme with the ListBox and DisplayMemberPath. They didn't work in my solutions. maybe that's will interested someone but I'm not sure that the best way. Hello, this is excellent and very useful, thank you. Did you ever get round to migrating the DataGrid or DatePicker controls as well? Thanks for converting this style I was actually doing this myself last night then found your blog and it saved me the trouble. However I am having a few issues with your conversion. Cannot resolve all property references in the property path '(0).(1). (2)[ 0 ].X'. System.Windows.Media.Animation.ColorAnimationUsingKeyFrames' animation object cannot be used to animate property 'Foreground' because it is of incompatible type 'System.Windows.Media.Brush'. Which is on line 3013 of SDKStyles.xaml. I'm using Visual Studio 2010 with all the latest updates and such, along with the Windows Phone toolkit installed. I'm fairly new to WPF so figuring out how to fix these issues alone is proving troublesome. Any help would be greatly appreciated. On a side note, the application will still run when compiled, it just wont show in the designer due to these errors. Johnathan, excellent! This is a great contribution indeed and saves us the conversion effort. I am happy. @Fredrik : I will do my best to fix it as soon as possible ! Couldn't you complete this UI? I'd need the expander, but it doesn't work - any ideas? Isn't there any other way to make it work? I've been trying to make it expand, but when I click on the expander the arrow toggles, but the content doesn't show up!